The energy of alpha particles varies, with higher energy alpha particles being emitted from larger nuclei, but most alpha particles have energies of between 3 and 7 MeV, corresponding to extremely long and extremely short half-lives of alpha-emitting nuclides, respectively. 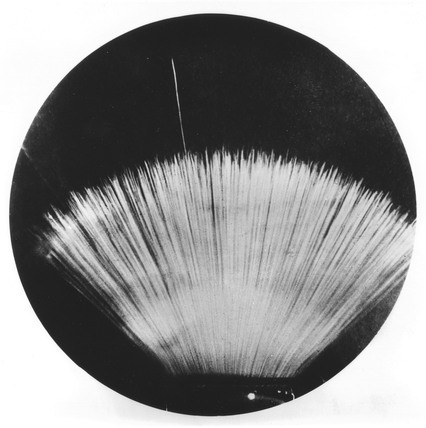 This energy is a substantial amount of energy for a single particle, but their high mass means alpha particles have a lower speed (with a typical kinetic energy of 5 MeV; the speed is 15,000 km/s, which is 5% of the speed of light) than any other common type of radiation (β particles, neutrons, etc.). Because of their charge and large mass, alpha particles are easily absorbed by materials, and they can travel only a few centimeters in air. They can be absorbed by tissue paper or the outer layers of human skin (about 40 μm, equivalent to a few cells deep). 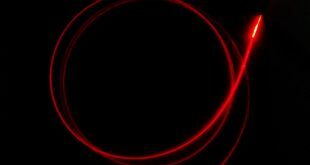 The interaction of charged particles or photons with matter is electromagnetic and results either in a gradual reduction of energy of the incoming particle (with a change in its direction) or in the absorption of the photon. Particles such as nuclei, protons, neutrons and mesons are subject to a nuclear interaction as well, which is, however, of much shorter range than the electromagnetic one. The nuclear interaction may become predominant only when the particles have enough energy to overcome Coulomb-barrier effects. Heavy charged particles lose energy through collisions with the atomic electrons of the material, while electrons lose energy both through collisions and through radiation when their trajectory is altered by the field of a nucleus (bremsstrahlung radiation). Therefore fast charged particles moving through matter interact with the electrons of atoms in the material. The interaction excites or ionizes the atoms, leading to an energy loss of the traveling particle. The mean energy loss per distance traveled of swift charged particles (protons, alpha particles, atomic ions) traversing matter (or alternatively the stopping power of the material) is described by the Bethe formula. For electrons the energy loss is slightly different due to their small mass (requiring relativistic corrections) and their indistinguishability, and since they suffer much larger losses by Bremsstrahlung, terms must be added to account for this. From the above equation it can be seen that the energy loss is only a function of the particle velocity, v, of the charge, z, of the incoming particle, and a function of the electron density , n, of the scattering material. It is interesting to note that the energy loss is proportional to 1/v2, so it increases as the velocity decreases. The force usually increases toward the end of range and reaches a maximum, the Bragg peak, shortly before the energy drops to zero. The curve that describes the force as function of the material depth is called the Bragg curve. This is of great practical importance for radiation therapy. 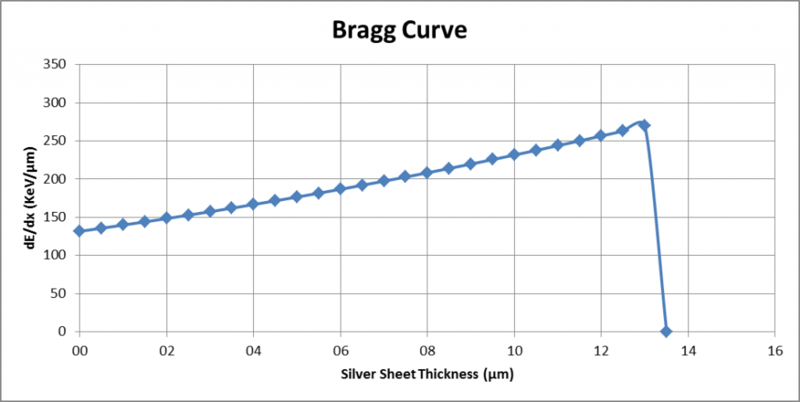 The experiment aims to measure the range of alpha particles in a dense material such as silver, evaluate the energy drop and plot the Bragg curve. The experiment on measuring absorbance of alpha particles in matter is based on the alpha spectrometer described in the post DIY Alpha Spectrometer. The instrument is based on a PIPS solid state sensor with active area of 100 mm2, the sensor is placed inside a vacuum chamber. The signal processing chain includes a charge sensitive preamplifier followed by a shaper amplifier. The signal, properly amplified and shaped, is acquired by the audio ADC of the PC and processed by the multichannel Theremino MCA analyzer. The image below shows the source and the silver sheets used as a screen. 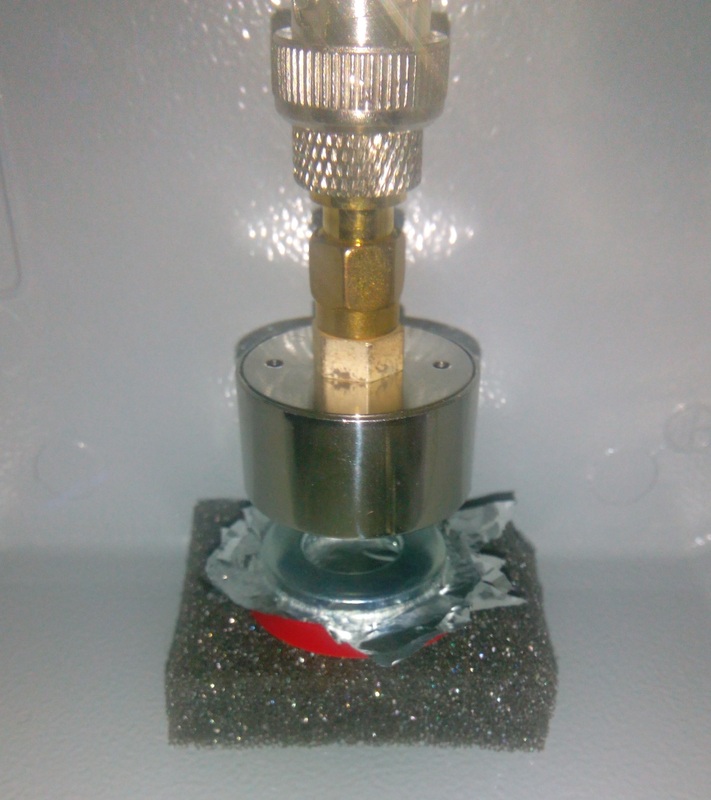 The image below shows the detector and shielded source for a measurement. In the range measure, the same number of alpha particles should be reaching the detector until the number of silver foil placed between the source and the detector reaches the range of alpha particles. Further increasing of the number of silver layers causes the counting rate of the detector should abruptly fall to 0. We point out that the relative position of source and detector is not changed and therefore the solid angle “seen” by the detector remains constant. The only variation is the increase in the scattering by the silver sheets that may result in a small particle loss from the beam. The results of this measure are shown in the graph below. 27 sheets of silver leaf were used before counting zero. 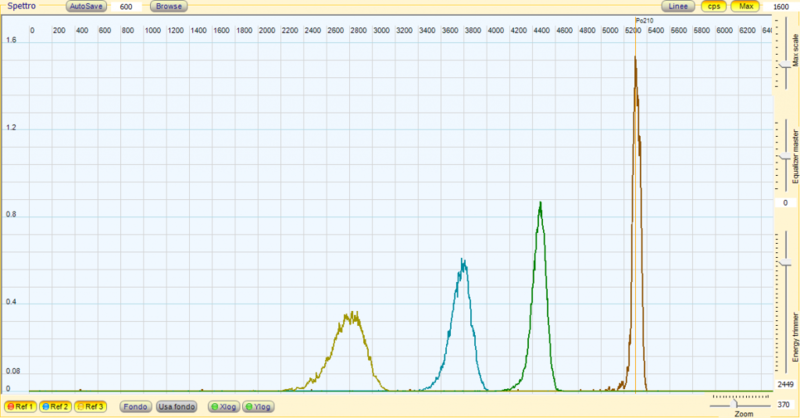 From the graph below you get a value of 12 μm for the range. As far the energy measurements are concerned, the image below shows the distribution of the detector pulse heights as obtained from our alpha spectrometer. Each peak corresponds to a different number of silver leafs. 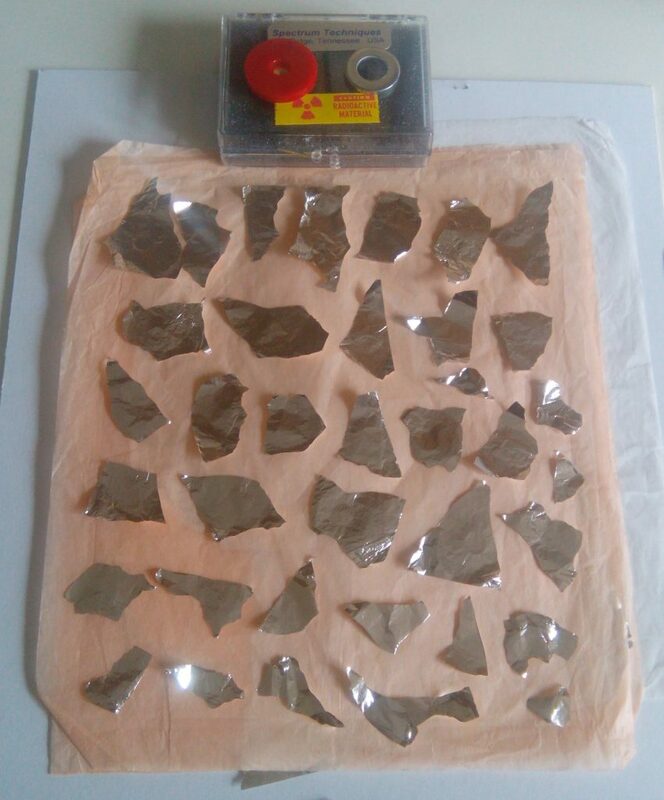 The first is obtained without silver sheets and corresponds to the Po210 alpha particle energy, the second corresponds to 5 layers, the third 10 layers and the fourth corresponds to 15 layers. The more are the silver layers the lower is the energy but the total particle count (area under the peak) remains constant. The thicker is the stopping material the wider is the energy peak : this is the energy straggling. Taking energy data for each number of layers, from 0 to 27 we obtain the plot below which shows the residual energy of a alpha particle when it reaches the detector as a function of silver thickness. The points are fitted with a polynomial curve. The second plot shows the curve obtained from the derivative of the energy curve, thus it gives the energy loss per unit length. It is called the “Bragg curve”. The experimental results for the Bragg curve are in good agreement with the theory : the obtained curve shows a 1/E dependence as predicted by the equations and the peak of the energy loss, just before it drops to 0, is evident : as the particle reaches the end of its range the energy loss dE/dx reaches a maximum and then it drops rapidly to 0.